You can still place an Avon Campaign 23 backorder until October 21st, 2013. Browse the brochures below, pick the items you wish to order (by item number) and Click Here! to enter your order. The order form will open in a new window so you can refer back to the brochure. You will have to select which campaign the item number is from to get the correct price. Thank you for shopping my Avon website. 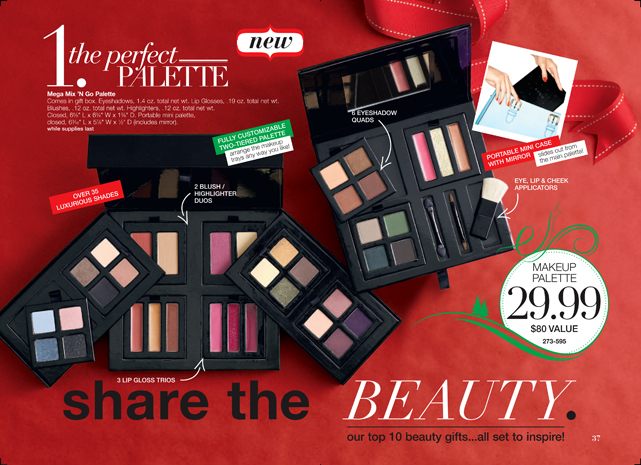 SHOP AVON CAMPAIGN 23 BROCHURE AND GET A JUMP ON THE CHRISTMAS SEASON! IN THIS ISSUE, BRING THE HOLIDAYS HOME with the coolest wreath on your door plus the hottest fashion and best of beauty all set to give, we’re ready to jingle all the way to Christmas day! Page 22, FASHION WISH LIST, Keep it hip when the temperatures dip. Avon Fashion Accessories in bold colors, cozy and cute jacket and scarf keep you warm this Holiday Season. Page 36, READY TO WRAP, Beauty Gifts Sets packed with holiday exclusives. Share the Beauty with our TOP 10 beauty gifts … all set to inspire! Page 66, FACE SALE, Winterize your makeup routine and stock up on essentials.Buy 1, get 1 for $5 on Liquid Foundations, Powder Foundations, Primers, Concealers, Blushes and Bronzers. Exclusions apply, see brochure for details.